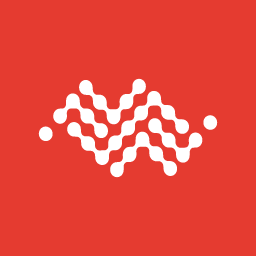 The Develop page shows the AirVantage compatible firmware and applications visible for all AirVantage users in the public repository (Public Apps) and the applications owned by your company or shared by your partners in a private repository (MyApps). If you are a developer this is where you can release your embedded applications and publish them to make them available to AirVantage users. When needed you can also share them with partners of your company. It also includes a section to create a new AirVantage Web API client and the reference documentation of the Web API (HTTP REST). The My Apps page lists all applications available for use in your company. If you are developing embedded applications using ALEOS AF, Open AT or for any non Sierra Wireless device, this section allows you to upload your application packages on AirVantage. For more information about how to read or write an application model you can look at the application page and the data section . To view the state and properties of the application. You can also download the application package used at the time the application has been released in AirVantage. To associate labels with an application. To upload a new application or a new revision. Use the package generated by ALEOS AF or Open AT AF Developer Studio. An application can be re-released with the same name and revision; this is called forcing the release. Changes are then visible to all companies and partners using the application. Only the owner of an application can release a new revision. To clone any application of your ‘private’ repository (My Apps). The cloned application will have the description: data, communication and actions as the original application. To publish the selected application and make it available for use in your company. This action is mandatory before you can perform a bulk installation for example. To share the selected application with some of your partners. To deprecate the selected application. A deprecated application cannot be installed anymore on new systems. To delete an application. Only deprecated applications can be removed. Released: initial state of the application. The application cannot be asscoiated to any system. Published: the application can be associated by any system (and thus be installed from AirVantage). Deprecated: The application can not be used anymore. Systems already associated can be still upgraded. The Operations section lists the operations related to applications. Check How to use Operations? for more details. 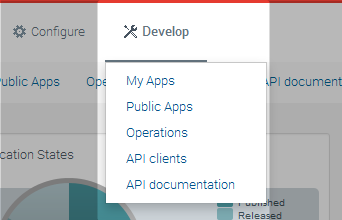 The API Clients section is for users who want to use an API for any kind of application. It lists all API clients and helps you create new ones, through the Create command. To create a new API client. How to create a new API client? To edit an existing API client. How to edit an API client? 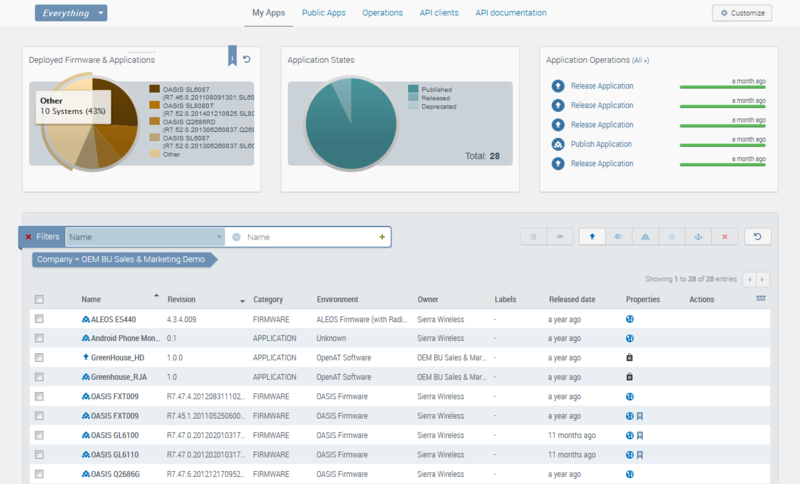 The API Documentation fully describes the API of the AirVantage. 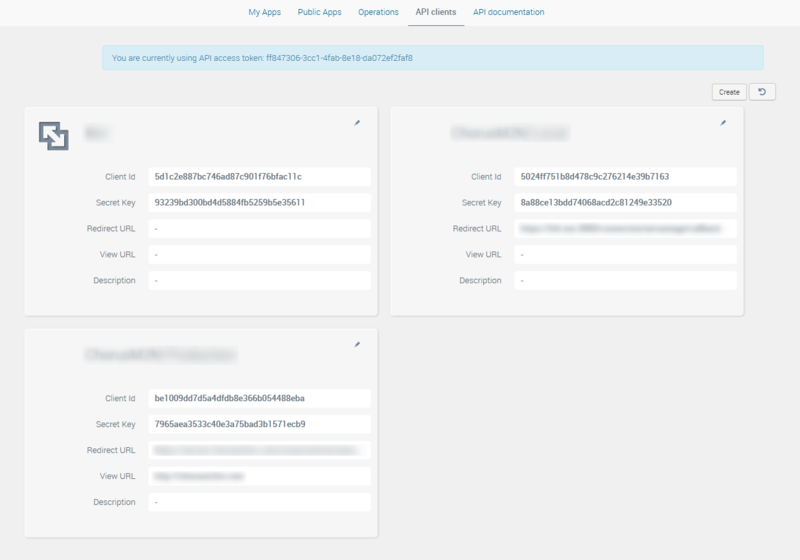 See the API Overview for more information.